A strong winter storm buffeted the San Diego area Tuesday, knocking out power to thousands of homes and businesses, flooding roadways, tangling traffic and prompting a 24-hour closure of SeaWorld. The wet and blustery conditions — the first dose of significant precipitation to hit the county in months — delivered much-needed moisture to the parched region, from two-plus inches along the coast to twice that amount in parts of the eastern highlands. At daybreak Tuesday, Oceanside had already received 2.41 inches of rain, Carlsbad 1.7 inches, Vista 1.56 inches and Lindbergh Field 1.19 inches, according to the National Weather Service. By late afternoon, the steady downpours had set a spate of local precipitation records — 3.8 inches on Palomar Mountain, exceeding the prior milestone of 3.79, set in 2005; 2.64 inches at Oceanside Harbor (1.19, 1980); 2.09 in Vista (1.24, 1980); 2.1 in Escondido (2.09, 1905); 1.63 in Campo (1.29, 1980); 1.5 in San Diego (1.25, 1866); 1.39 in Alpine (1.02, 1980); and 0.65 in Chula Vista (0.62, 1930). As of 5 p.m., the county’s 48-hour rainfall totals included 4.88 inches at Birch Hill; 3.63 at Boucher Hill; 3.45 in Mesa Grande; 3.4 in Skyline Ranch; 3.28 in Oak Grove; 3.22 in Bonsall; 3.2 at Henshaw Dam; 3.15 on Mount Woodson; 3.09 at Lake Cuyamaca; 2.8 in Fallbrook; 2.79 in Ramona; 2.76 in Pine Hills; 2.58 in Valley Center; 2.42 in Carlsbad; 2.38 in Santa Ysabel; 2.31 in Poway; 2.23 in Descanso and on Otay Mountain; 2.14 in Julian; and 2.02 in Harbison Canyon. Among other two-day precipitation tallies were 1.89 inches in San Diego Country Estates; 1.83 on Volcan Mountain; 1.78 in the Granite Hills area; 1.77 in Kearny Mesa; 1.73 in University Heights; 1.68 at Montgomery Field airport and in Scripps Ranch; 1.67 on Mount Laguna; 1.62 in La Jolla; 1.61 in La Mesa and San Marcos; 1.54 in Santee; 1.51 in Mission Valley; 1.48 in Lakeside; 1.47 in Flinn Springs; 1.39 in El Cajon; 1.34 in Del Mar; 1.3 in Ranchita and San Ysidro; 1.29 in Mission Beach; 1.15 in Solana Beach; 0.96 in City Heights; 0.91 in Lemon Grove; 0.79 in San Onofre; 0.67 in Borrego Palm Canyon; 0.22 in Agua Caliente; and 0.12 in Ocotillo Wells. The downpours prompted SeaWorld to shut down for the first time in nearly a year. The tourist destination, which last closed due to heavy rain on Feb. 27, was slated to re-open Wednesday, park spokesman David Koontz said. In the South Bay, a landmark movie-house sign toppled over amid the windy deluge. 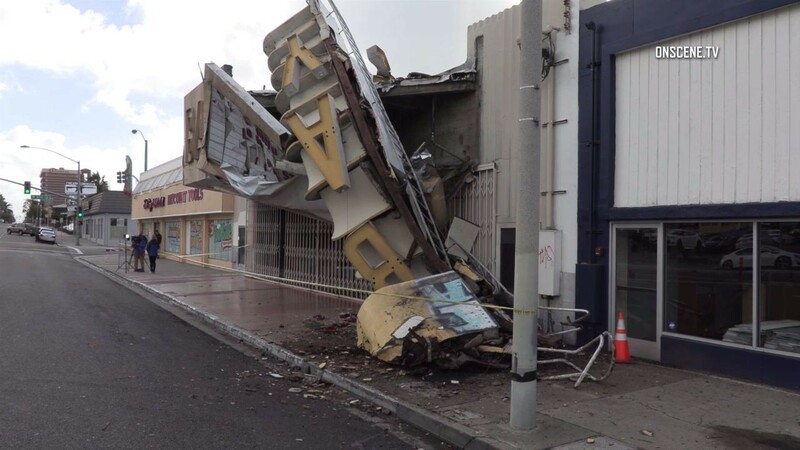 The yellow-and-white, roughly three-story-tall structure atop the Bay Theatre — featuring a giant “B,” “A” and “Y,” from top to bottom — crashed down at some point during the night or early morning, landing on a sidewalk and breaking apart, National City Emergency Services Director Frank Parra said. The partial collapse of the 1940s-era building, which in recent years has been home to a church congregation, caused no reported injuries, though it did force a road closure. In Coronado, about 10 boats came free from their moorings amid the tempestuous conditions and drifted off into wind-whipped San Diego Bay, a city official said. Over the morning, nearly 2,400 San Diego Gas & Electric customers found themselves without power in the coastal North County, including Cardiff- By-The-Sea, Carlsbad, Encinitas, La Costa and Olivenhain. Another 530 customers were without electrical service from three separate weather-related outages in San Diego and Chula Vista, and another four blackouts cut off power to about 1,000 addresses along the coast in La Jolla, just south of Escondido and in the Viejas area. By midday, only 208 addresses remained out of service, with 81 of those lapses confirmed as related to weather, SDG&E reported. The showers also led to some typical rainy-day headaches on San Diego- area roadways. Between midnight and 4 p.m., the California Highway Patrol logged 364 collisions across the county, compared with the 140 or so crashes that the state agency responds to locally over an entire 24 hours of fair weather. No serious injuries were reported. Additionally, flooding, mudslides errant boulders and other problems wreaked by the storm forced closures of various roads over the morning, including the 12000 block of Lemon Crest Drive in the Winter Gardens area; Mapleview Street at Pino Drive in Lakeside; Mussey Grade Road at Mahogany Ranch Road in Ramona; stretches of Bent Avenue and Via Vera Cruz in San Marcos; traffic lanes along the San Diego River near Fashion Valley mall; state Route 76 at Pala Mission Road in Pala; and National City Boulevard between Third and Fourth streets, due to the demise of the aged theater sign. Snow levels were expected to drop as low as 5,000 feet overnight, making influxes of frozen white flakes possible in the highest reaches of the county, meteorologists said. A high-wind warning that went into effect at 6 a.m. for Julian, Pine Valley and Borrego Springs was set to expire at 10 p.m., and a less-serious wind advisory also was issued Tuesday morning for Carlsbad, Chula Vista, El Cajon, Encinitas, Escondido, La Mesa, National City, Poway, San Diego, Santee, Vista and San Marcos. Among high wind readings over the morning were 73 mph on Boucher Hill; 71 mph on Palomar Mountain; 61 mph in the Coronado Cays; 60 mph on Mount Woodson; 57 mph at Lake San Marcos; 56 mph on Otay Mountain and in Valley Center; and 55 mph in Alpine Heights, Jamul, Shelter Island and the Silver Strand area. San Diego city administrators urged the public to refrain from calling 911 for downed tree limbs and flooding unless the conditions constituted an emergency. Officials said non-critical public-works problems should be reported to the city’s dispatch center at (619) 527-7500. The rains were expected to continue overnight before weakening and petering out early Wednesday, ushering in dry and warmer conditions from Thursday through the weekend, according to forecasters. Posted in Life | Tagged flooding, power outage, rainfall records, SeaWorld closed, storm, storm damage, streets closed, what is the weather forecast for San Diego?